"with the yacht and boat-threw Burmester in Bremen castle ran on 30 June 1966 a ship of pile, which was baptized on the name" WALTHER OF LEDEBUR ". It will thus drive a ship, which carries our surname in foreseeable time into north and Baltic Sea and into the Atlantic inside. Thus the activity of a man is recognized, who was considerably in the mine development of the war navy involved from 1925 to 1945. The ship excites structurally large interest, since new ground was walked on here. It is the first wooden ship of this size, which is manufactured exclusively in the glue procedure, without nail and pin. It is 63 m long, 10.6 m broad, has a depth of 2,70 m and displaces 725 t water. It should the testing of new mine-clearing equipments serve and must for this reason be to a large extent amagnetisch. 2 May brook marine diesel engines of 2500 HP each are to make speeds possible up to 19 knots over variable-pitch propellers. The ship will receive a civilian regular crew from 37 men, is not supplemented those for tests by specialists an artillery armament is intended. The baptism found wonderful summer day at the none between many rain days lying at the end of June instead of. I had seen in former times in Kiel launchings of a vessel of very many larger ships in according to large shipyards in the presence of many thousand humans. Here in the small throwing area at a staff of two or three hundred men and only spectators directly taken part had expressed everything a personal Gepraege - completely apart from the fact that I was completely particularly concerned, when I spoke the words. "I baptize you on the name" Walther of Ledebur "and wish you all time good travel and lucky return"
The baptizing speech had held Walthers of coworkers and friend of many years director of building of governments Kersten. Afterwards I was congratulated by all sides and was suddenly in the center of the whole happening. We observed the launching of a vessel after the baptism, then the ship was gotten carefully to the equipment place. I was allowed the size still falling on the still bald deck particularly in the eye on board to go and could to regard. In some months the ship is to be handed over and placed into service. Followed a meal in of Bremen the vinegar house, which went with many speeches and discussions in the afternoon to end. Now I, "my ship" hope soon in Eckernfoerde, its home port, to experience in its element. On 13 March 1993 became more?Walther by Ledebur? then finally, very to the disappointment of the crew, deactivated. Sailor Wigbert v.Ledebur, the grandchild of the name giver, accompanied her on the last travel. Dead-said live longer - the vernacular states and is right often enough thereby. The old saying proved to be true in the naval base Eckernfoerde north. 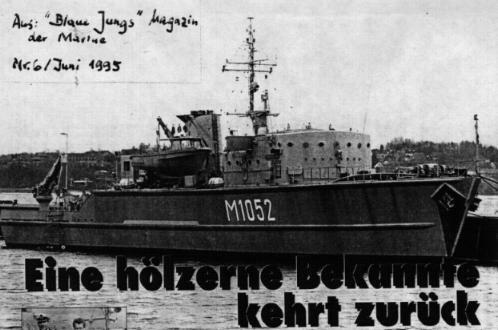 There on 6 April 1994 the mine clearance diver boat Muehlhausen was activated. The Muehlhausen is an old acquaintance. Rather exactly one year before was superseded the ship under the name "Walther of Ledebur", which drove for the military engineering agency. Now the largest wooden warship of the world returned again to Eckernfoerde.